I remember the first time I attended a public hearing in Boston City Hall back in 2014. It was led by Chair of the Committee on Arts & Culture, Councilor-At-Large Michelle Wu, now council president. Also participating were Councilors Matt O’Malley, Ayanna Pressley, and Tito Jackson. I was inspired by the words of those who spoke during the public hearing, and I began to jot down my thoughts on the status of arts and culture in our city, and the importance of collective social impact, bridging boundaries, and breaking down silos. In the hearing, I heard representatives of arts and culture organizations, individuals, and advocates echoing each other on many topics: funding, public art projects, and the like. But I didn’t hear enough about youth art. I heard questions like, how do we funnel funding toward arts and culture in Boston? “And I thought,” what about the youth? Are young people not the future innovators and creative thinkers of our nation? I believe that bridging youth and the community through art is the most important force to innovate and put our city and its people on the map. It’s building global citizens that will lead our country confidently and creatively. In my mind, other questions were swirling, too: How can art create a collective social impact involving the entire community? In art, do you need to use your right brain alone or your left brain too? How does a child best learn basic math? Do great mathematicians become the best artists, or do artists become great mathematicians? How do we find alignment and connection? How do we think outside the box? Julie Burros, appointed Chief of Arts and Culture in September 2014, believes the arts are as important as the sciences to Boston’s culture of innovation, and has said, “removing barriers is a huge part of my vision.” But it would be sad to focus on great art and culture projects in Boston without a clear and strong pledge to include our youth. 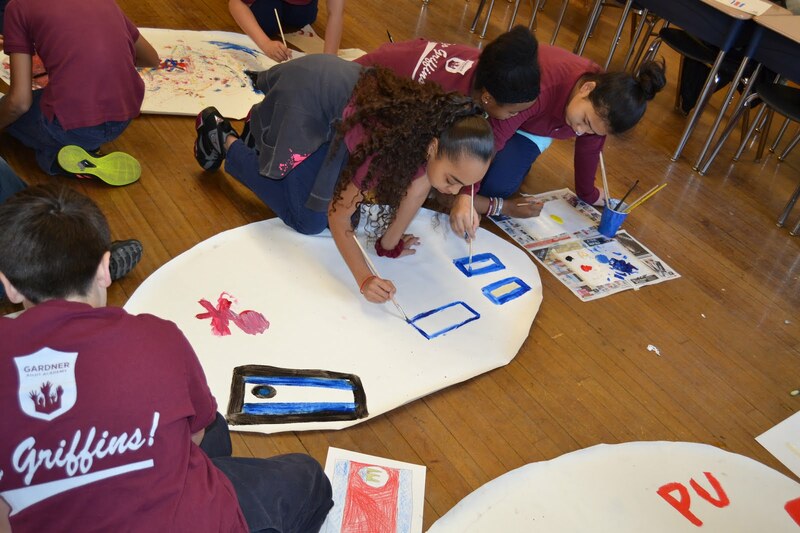 I want to transform our city into a place of cultural inclusion that enriches our schools and youth first. My vision is that the city would establish an art and culture “incubator,” working to build a strong foundation to unlock the full creative potential in our young people -- to empower our youth to become artists, scientists, engineers, doctors, and architects. We need the collaboration of great minds to fulfill this ambitious, yet crucial vision. Funding for public art is imperative, and it’s wonderful that we have artists eager to enrich our city. Nevertheless, I am left puzzled in the face of so many Boston Public School budget cuts, leaving art programs so hard to find in so many schools. While encouraging artists to create public art, why not also ask them to visit schools to work with our students? We need to build a strong foundation for learning during the K-12 years. Through arts integration, ideally with exposure to people who are making a life in the arts, our youth will have an opportunity to unlock their creative potential. 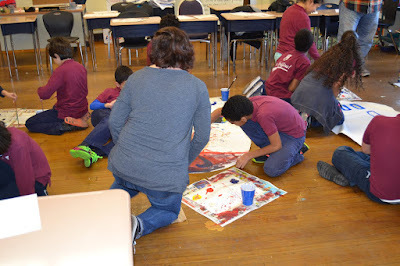 Mayor Martin J. Walsh and Arts and Culture Chief Julie Burros attended the mural unveiling ceremony, and the Red Sox were event sponsors, providing refreshments to attendees, including our student-artists and family members and teachers. After two years of dreaming and hard work, the “I Am, We Are” mural project became a life-changing opportunity for our Boston Public School students, who were given the power to make their mark physically, visually, and creatively in their own local community of Boston. This mural creation is an example of how art education can develop children's self-esteem, celebrate their community, and guide them on their journey of exploring who they are. They were encouraged to reflect on the facets of their identities and to listen to each other’s perspectives. These exercises in intercultural understanding are reflected in ARCK’s overall curriculum, which emphasizes three key areas of global citizenship: leadership, civic engagement, and social justice. There is truly power in our youth, and it is important that we give every individual an outlet for expression. This mural project is the beginning of something that could spread nationwide. I am so grateful to have been part of this unifying artistic and cultural accomplishment. This mural project has validated the vision I had when I first decided to start ARCK back in 2012. I was a mother concerned about the creative development of her children, and I wanted to make a difference. However, in order to make a difference, we must call on the whole community. We're all in this together. I sincerely believe that ART TAKES A VILLAGE.